Kochi, March 30: A robotic drone that can send real-time video of ships and other underwater structures to help with their repair and maintenance has won a prestigious US-centered hardware startup competition that was held in India for the first time at the Kochi-based electronics incubator Maker Village. 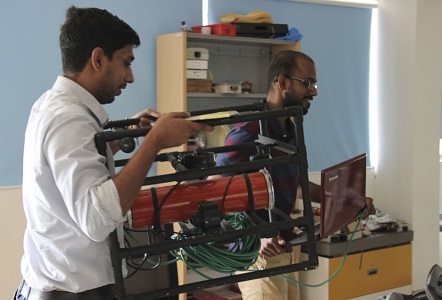 EyeROV, developed by Johns T Mathai and Kannappa Palaniappan P, was selected from seven finalists out of 35 applicants in the Kochi leg ofAlphaLab Gear National Hardware Cup — the competition’s first pilot in India to evaluate hardware tech startups who are ready to launch their products in the next 3-6 months. The eyeROV drone can be navigated up to a depth of 50 meters to take real-time HD video images to examine ship hulls or undersea cables or bridge moorings, eliminating the need for costlier and riskier manual inspection by divers. EyeROV which was tested on India’s First Solar Ferry in Kerala’s Vaikom, offers high maneuvering capability at low cost and can be put to uses ranging from inspections of ship hulls, ports, dams and nuclear power plants, to search and rescue, naval mine detection and ocean studies. The team, incubated at Maker Village, will receive a cash prize of Rs. 25,000 and a chance to participate in the finals on April 18-19 in Pittsburgh, where they will compete with seven US regional winners and five international winners for a $50,000 Grand Prize, along with the chance to be accelerated for 3-6 months by AlphaLab Gear, and a host of other prizes. Their trip to the US will be sponsored by AlphaLab Gear, the TiE chapter in Pittsburgh, and Maker Village. EyeROV had stiff competition in the final round on Monday (March 27) from innovative products including an IoT (Internet of Things) device to help farmers avoid catastrophic beehive collapse by forecasting when bees are likely to swarm away and a women’s safety garment that allows the wearer to send a distress signal and to provide a nasty shock to assaulters. Other products in the final round included an advanced brainwave-sensing set of earphones for stress management, a keyless mechanism for homeowners to remotely lock and unlock their houses, an IoT mechanism to provide inventory management and tracking services for high-value goods, and a wearable, gesture controlled glass that can be used by disabled people. Ms Thenmozhi Shanmugam, founder of fundcloud Partners, a Startup Ecosystem enabler, and principal partner in organizing the event, said the quality of the participants was so good the judges had a hard time picking the finalists and winner. “The ideas and concepts presented at the competition were excellent. We evaluated the demos in terms of product usefulness, market opportunity, founding team with industry experience, and if they are in a stage to launch in the next 3-6 months. We wanted to choose a startup that could best use the opportunity to be accelerated by AlphaLab Gear space, network and manufacturing guidelines, access to market and ecosystem development,” she said. The finalists and winner were picked by a panel consisting of Ms Shanmugam, Mr Jeyash P, from Konglo Ventures, an early stage fund operating in Kerala & the US; Mr Sreekumar V M, from SFO Technologies, the largest contract manufacturing arm of Nest Infotech; and Prof S Rajeev, Chief Consultant, Maker Village. What Makes League of Legends So Successful?